MarkDaniels.Blogspot.com: Are you welcoming the stranger? A woman who, before moving to another community, was a member of a church I once served as pastor, told me that she, her children, and her grandchildren worshiped with a Lutheran congregation in the town where they now live on Christmas Eve. She said that it was wonderful to once more sing Silent Night by candlelight. But she also said that nobody greeted her or her family or asked anything about them. Reading that broke my heart. If there's any group of people who should be committed to welcoming strangers on Christmas Eve, it ought to be Christians who confess a Savior who had "no place to lay his head" (Luke 9:58) and who themselves are told by God to see themselves as strangers just passing through this world (1 Peter 2:11). God's Word is clear that, in response to God's gracious acceptance of us in Christ, disciples of Jesus are to practice hospitality toward others. Referring to an Old Testament visitation experienced by Abraham and Sarah, Hebrews 13:2 tells Christians: "Do not neglect to show hospitality to strangers, for thereby some have entertained angels unawares." Jesus takes this command of hospitable behavior even further when He says in Matthew 25:31-46, that when we serve the hungry, thirsty, homeless, naked, or imprisoned, we really serve Him. We are then, as Martin Luther put it, to be "little Christs" who serve Christ in others. The Savior Who welcomes us into His kingdom simply because we trust Him to renounce our sins and place our faith in Him, a gracious welcome we don't deserve and can't earn, commands that, in return, we welcome and reach out to the stranger with His good news. Of course, many Christians fail to welcome those who are "strangers" to them for fear that they might be embarrassed before people they feel they should have known. I've heard this excuse many times. But tell me: Before who would you prefer to suffer embarrassment, a person to whom you may have to admit a faulty memory or the God Who calls you to love your neighbor as you love yourself? It's always best to err on the side of love, of grace, of welcome. It's always best to get over yourself enough to not be afraid of being embarrassed by your humanity. If you seek to live in daily repentance and faith in Jesus, you belong to God's eternal kingdom. What's a little embarrassment compared to that? 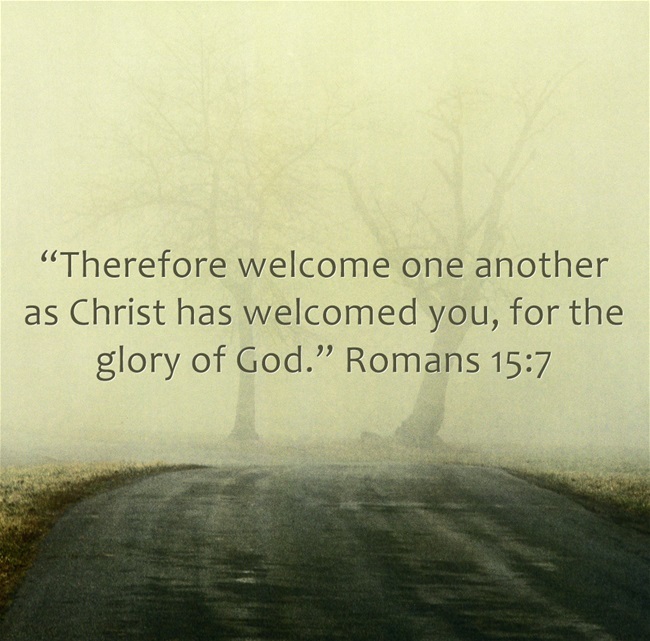 So Christians, greet those who are strangers to you when you see them in worship. And I want to say to those who aren't church regulars or who are non-believers who may have come to a church worship service and been treated like you weren't there: I beg you to forgive us and to give a church near you another chance sometime soon. We aren't perfect, although we follow a Savior Who is. We're a fellowship of recovering sinners. We pray that you'll worship God with us sometime soon. And Christians, if you've neglected to greet those who are strangers to you not because you failed to recognize those strangers, but just because you didn't want to talk to someone you didn't know, repent of this failure to love neighbors as you love yourself and ask God to help you to be a loving, welcoming disciple of Jesus the next time you encounter a stranger. We all fail to do God's will in different ways in our lives. But the Lord Who judges the thoughts and intentions of our hearts (Hebrews 4:12) bears grace for those who seek to love as they've been loved by God.